The only way to start a charcoal fire is with a chimney. Never use charcoal that says self-igniting because it has an accelerant in it. I can taste it in the meat. Never use charcoal fluid for the same reason. But chimneys work great. They allow you to measure the correct amount of coal, get it lit in a hurry, and they don't taint the meat. Here's how they work: First you stuff newspaper or a ice cube sized block of paraffin into the bottom compartment, pour charcoal into the top compartment, then you light the paper or paraffin, and in about 20 minutes the coals are white and ready. No chemical aftertaste, no solvent smell in the air, and it's a lot cheaper and safer than using lighter fluid. The Weber brand of chimney is my favorite and lasts longer than the cheaper model shown above. If you use newspaper, don't stuff too many in there or you will choke off the air flow. I use three sheets exactly (that's 6 pages), and I try to leave a small hole in the center so air can flow up. In other words, make a donut in the bottom of the chimney. Some folks splash a little vegetable oil on the paper but I never need to. 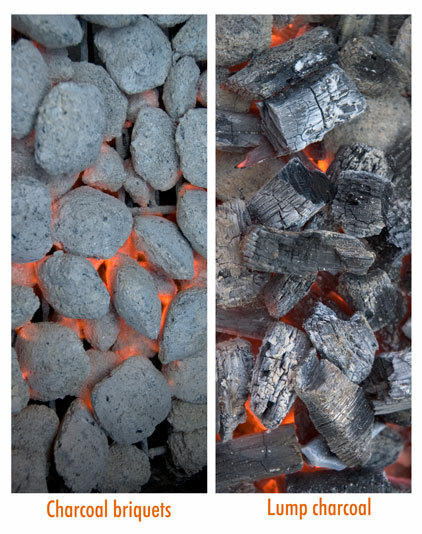 Charcoal briquets should be coated with white ash before you start cooking. The reason is not for flavor, it is because when coals are white they are at max heat. If you start cooking sooner they will get hotter as they sit. The key to good cooking is temperature control, and if the coals are not white you are not managing the fire, it is managing you. OK, there is one more way to light charcoal. Some competition teams take a propane torch, mound up the coals, and letter rip. White coals in a flash. For long cooks you will need to add more charcoal. It is best to light the charcoal first and add white coals. Cold coals added to the fire will cool the oven. Some sensitive tasters say they can taste the additives when unlit briquets were added. Yet another reason to use lump charcoal. You can extinguish a charcoal fire by dousing it with water, but beware of the steam that generates and the hot water that pours out of the bottom of your grill. If you have a ceramic grill, never use water to douse the fire or it might crack. I prefer to suffocate the fire by closing all vents. The coals can then be shaken to sluff off the ash, and used again. Never cook with charcoal or gas grills indoors. They produce carbon monoxide and that can kill you. Because charcoal is mostly pure carbon plus additives, the wood from which it is made will make little noticeable difference in flavor or burning temperature. To get wood flavor, you need to add wood to the fire. Read my article The Zen of Wood for how this is done. Let's ask the question: What's the best form of charcoal? Wood embers? Hardwood lump charcoal? Charcoal briquets? Let's answer the question: For most cooking, it is charcoal briquets. And please, all you lump charcoal devotees, read on before you start cursing me in the comments. Let's look at the facts: A lot of hot shot cooks swear by one fuel or another, but I'm here to tell you, it is much ado about little. The quality of the raw food is far more important. The seasonings are far more important. And without a doubt, getting meat off at the right internal temp is far far more important (see my meat temperature guide). You can spend a lot on expensive charcoal. Save your money and get a good thermometer (see my buying guide to thermometers). The secret to successful cooking, indoor or outdoors, is controlling variables, the most important of which is heat. Charcoal from a major national brand like Kingsford is very consistent from batch to batch in heat output and duration. As you gain experience you will learn just how hot your cooker will get with a measured amount of charcoal and just how much more to add when they burn low. But other fuels have their strengths at weaknesses. Let's look at them. In the beginning barbecue cooks dug a trench in the ground, threw in dry twigs, threw logs on top, and then lit the twigs. They quickly learned the temperature was easier to regulate and the flavor better if the logs burned down to coals before the meat was placed above. Do not try to cook with logs. It is very hard to control heat with logs. 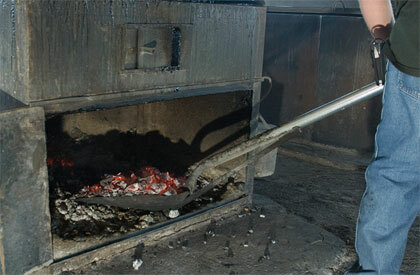 Logs can produce meat that is too smoky, pungent, bitter, and reminiscent of an ashtray. If you want to cook with wood, burn it down to glowing embers first. Clear a bare patch of dirt, sand, or concrete, set a bunch of well-dried logs on fire, let them burn down to coals so there is no bare wood or bark showing, and then shovel them into a grill. That's how purists such as Cooper's in Llano, TX, do it, below. The advantage is flavor if you can manage it. Hardwood smoke seeps into meat fibers coloring the meat's appearance, aroma, and taste. This is the essence of barbecue. The disadvantage is that you have to buy lots of hardwood, preferably the same exact kind, cut it to size, age it until dry for months, have a place to burn it to coals, transfer the coals to the cooker, and then have more burning in case you need them. 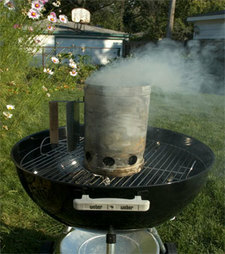 Then you need to know how to use the coals, because it is easy to oversmoke meat cooked over wood coals. This is a big part of the art of classic barbecue. This is why they call people who cook with wood pitmasters. If you are tempted to try burning wood, avoid using lumber scraps. Most lumber is treated with poisonous chemicals to repel vermin such as termites. It might also repel your family. Hardwoods such as oak and maple, nutwoods such as hickory, and fruit woods such as cherry or peach, are best for cooking because they have the fewest impurities and the best flavor. Pine is full of turpines which make unpleasant and possibly poisonous smoke. Hardwood lump is the next best thing to cooking with hardwood. It is mostly pure carbon, called char, made by heating wood in a low oxygen environment, a process that can take days and burns off water, methane, tar, and hydrogen leaving a black lump about 25% of the original weight, that packs more potential energy per ounce than raw wood. The process is ancient, with evidence of charcoal production goes back 30,000 years. Commercial production was first done in pits covered with dirt by specially trained craftsmen called colliers. Today hardwood lump charcoal is made mostly from scrap from the lumber making process. Bark, limbs, odd chunks, and ends from the mill are carbonized by smoldering them in a kiln, a steel or stone building with just the right amount of oxygen allowed in. Very little. The result is chunks that are irregular in size, but burn clean, produces good flavor, and leave little ash. The big disadvantage is that lump is harder to find, more expensive than briquets, burns out more quickly, varies in BTUs (heat output) per bag, varies in wood from bag to bag, and often bags of lump contain a lot of useless carbon dust from improper filtering in the factory and rough handling in the stores. For definitive ratings and reviews of lump charcoal, visit Doug Hanthorn's website, a.k.a. the Naked Whiz. Conventional wisdom says lump burns hotter than briquets, but the folks at Cooks Illustrated claimed conventional wisdom to be wrong. They took two typical six quart chimneys and filled one with lump and one with briquets. They fitted two identical grills with seven digital thermometer probes each, and learned that by volume, not weight, and volume is how most of us measure charcoal, especially if we use a chimney, the two burned about the same for about 30 minutes, but after that the briquets held heat longer and the lump turned to ash faster. Because charcoal burned hotter and cleaner than wood, it was used by smelters for melting iron ore in blast furnaces, and blacksmiths who formed and shaped the steel. Making charcoal was the job of the collier. Below is Part 1 a great video sequence by Van Wagner about how colliers made hardwood charcoal in Pennsylvania from the 1600s to the mid 1800s, and how you can do it yourself if you are so inclined. Click here for Part 2, Part 3, and Part 4. Click here to watch a fascinating 9.5 minute video from KETV, the PBS station in St. Louis, of how Henry Strump makes hardwood lump charcoal in Steelville, MO. 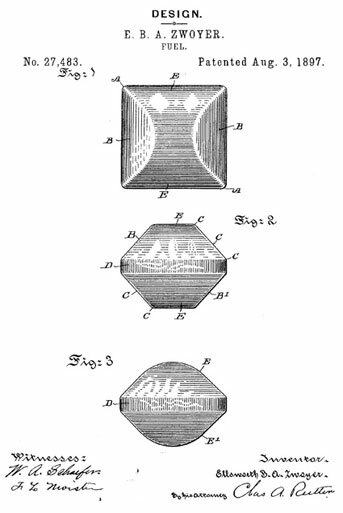 Patented in 1897 by Ellsworth Zwoyer, the briquet really took off when, in the 1920s, Henry Ford, in collaboration with Thomas Edison and EB Kingsford, made lots of them from sawdust and wood scraps from Ford's Detroit auto plants. The company was later sold, and today Kingsford, a division of Clorox, converts more than one million tons of wood scraps into briquets a year. So Ford not only brought the world affordable cars, he created an industry that made backyard barbecue easy. According to Kingsford, their regular Sure Fire briquets in the blue bag are made by heating sawdust and wood chips from mixed woods in special ovens with little or no air which removes water, nitrogen, and other elements, leaving almost pure carbon. Once the charcoal is prepared it is crushed and combined with anthracite coal, mineral charcoal, starch, sodium nitrate, limestone, sawdust, and borax. The additives act as binders, improve ignition, promote steady burning, and make manufacturing more efficient. Briquets typically produce more ash than hardwood lump since they contain more non-combustible materials. Snobs complain about these additives, but there's a lot to be said for a fuel source that is consistent from bag to bag. Sensitive palates say they can taste the additives in the food. I can't. Some self-igniting charcoals such as Kingsford Match-Light contain paraffin, petroleum products, or other accelerants. Kingsford and government regulators say it is safe if you follow instructions, but I fear that it will taint the food. Call me superstitious, but I don't use the stuff and I don't recommend it. Charcoal is easy to light with chimneys and I highly recommend them. In 2008 Kingsford introduced a new line of briquets called Competition Briquets. Kingsford claims they are made with only charcoal from wood, starch as a binder, and a bit of borax to help it release from the manufacturing presses. Compared to the regular Kingsford Blue Bag briquets, they ignite slightly faster, burn slightly hotter, and produce less ash. Burn time is about the same. My friend, John Dawson, a.k.a. PatioDaddio, did a comparison test of regular Kingsford and Kingsford Competition that is worth a read. Sensitive palates say Competition tastes better. Problem is they cost almost twice as much as the standard blue bag briqs which are frequently on sale. There are other good charcoals out there. I like Royal Oak, and Duraflame Real Hardwood Briquets as well as Wicked Good 100% All Natural Hardwood briquets are made from just char and starch. Alas they are not widely available. Harry Soo of Slap Yo Daddy BBQ, one of the top 10 competition teams year in and year out once told me "I buy whatever is on sale." Here's a uselful rule of thumb: There are about 16 Kingsford briquets in a quart, and 64 in a gallon. A Weber chimney holds about 5 quarts, or about 80 briquets. There have been a few new charcoal substitutes introduced in the past few years. I have only tried one, called Lokii, and I am unimpressed. Lokii is made in China and advertised as an "all-natural product." It is a giant seven cornered briquet about 5" wide and 2" thick. It comes in a plastic bag that is a pain to get open. As soon as it is opened I smelled something like solvent, despite the manufacturer's all-natural claims. The top is made of a different material than the bottom, and you must light the top. It is slow to ignite and then the fire creeps across the surface. V-e-r-y-s-l-o-w-l-y. I lit one, and the surface was all white by the time I successfully got the second lit. The first one was at full heat, well over 400°F, in about 25 minutes, while the second one was still smelly and incomplete. When I tried to move the first one with tongs it fell apart. I never got a good hot fire for cooking two ribeyes and dinner was an hour late while I went back to lighting regular charcoal. A manufacturer recently sent me some charcoal made from coconut wood, but I have not tried it yet. I use Kingsford Blue Bag for most cooking because I have a good feel for how many briqs will produce the desired temps in my cookers, because they remain constant from bag to bag, and because stores often place them on sale so they are cheap. I switch to Kingsford Competition for steaks, when I want max heat. I never buy Match-Light or any charcoal impregnated with accelerant. Neither do I buy charcoal with wood chips impregnated. I prefer to control the amount of wood by adding it manually. Bottom line: Some folks make way too much of charcoal. The quality of the raw food, seasoning, sauce, cooking temp, and serving temp faaaaar outweigh the impact of charcoal on outcome. I say pick a brand and stick with it. 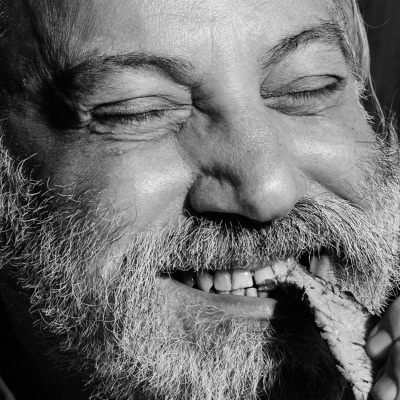 For more of Meathead's writing, photos, recipes, and barbecue info please visit his website AmazingRibs.com and subscribe to his email newsletter, Smoke Signals.